A key part of running your own business is identifying risks and mitigating them, always hedging your bets. We had an interesting example recently with a prospective client that almost lost out by discounting quotes for business financing, believing that they had their requirements covered by other lenders that subsequently withdrew their indicative offers. In this particular example, the client already had two providers that had outlined indicative terms (both were companies that we deal with but we didn't think they were likely to accept the type of issues that came with this deal) and they approached us for competitive quotes. We introduced them to two other providers that we knew would be able to deliver. The deal had a few issues that we were concerned would not be acceptable to all providers, so we were careful to select funders that we knew would be able to deal with those issues. Our client received quotes from our lenders, and initially discounted both of them on the basis that they were more expensive than the quotes they had already received. 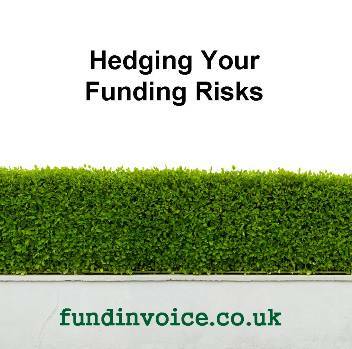 We councilled our client not to discount the quotes from our providers as facilities from the other funders were not yet "done deals" - hedging their funding risks. The conversation was left there but during the process we spoke to our own contacts at the two providers the client had sourced themselves, and without disclosing the client's details we sounded them out about their approach to the risk issues that this deal presented. Sure enough, in both cases they suggested that they would not fund such a deal, but we went no further and left it with our client. Interestingly, we had a call from one of the providers that we introduced to say that they client had re-initiated contact with them after the providers sourced by the client both withdrew their indicative offers once they fully understood the issues that surrounded the proposition. Lots of invoice finance companies will provide indicative terms without detailed risk analysis of a proposition. Until you have accepted an formal offer, and all the steps in their sales process have been completed satisfactorily e.g. survey, searches etc, you really don't know if they are going to be in a position to proceed. Our advice is that you hedge your bets, and mitigate the risk that your chosen provider withdraws their offer. Don't discount any offers, or providers, until you have a "done deal".